Home > Ask Our Experts > How to Tone Thighs Without Becoming too Muscular? I would like to tone my thighs and my calves but I don't want them to get big or too muscular. Which gym equipment should I use? It's a good idea to ask this question before you start working out at the gym because it helps to have a clear picture of the type of physique you are working towards. 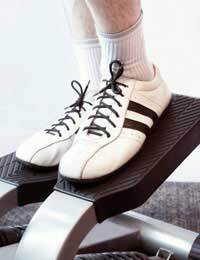 In order to tone up your calves and thighs without getting really muscular, it's not so much a question of what equipment you use in the gym, but rather how you use it. Most of the core gym equipment that is focused on calves and thighs can be adjusted with different types of weights. The most important thing to bear in mind is that you are not trying to get the heaviest weight here! You don't want to be one of those heaving, sweaty blokes that try to lift three times their body weight. You want to do a high number of repetitions at a low weight in order to tone without getting bulky. A good place to start is three times eight repetitions, at a weight low enough to make it feel pretty easy. Even 500g weights will tone you up, so don't get carried away with putting the weight up as this is when you start to get bulky - and don't forget this happens slowly so you can almost not recognise it happening until someone points it out to you and you are looking in a way that you don't really want. Stretching is also a key part of toning without bulking. A good stretching regime is easy, enjoyable and relaxing. You don't have to go to the gym to do it either, so it's really easy to incorporate it into your daily routine, which helps keep your muscles long and lithe. Perhaps try a home pilates DVD, or do ballet stretching. If you can get a weekly routine going of gym once or twice, using low weights at high repetitions and daily, slow, purposeful stretching at home (do it outside first thing in the morning for an even more effective, rejuvenating experience), you'll soon be seeing a strong, toned body looking back at you in the mirror.